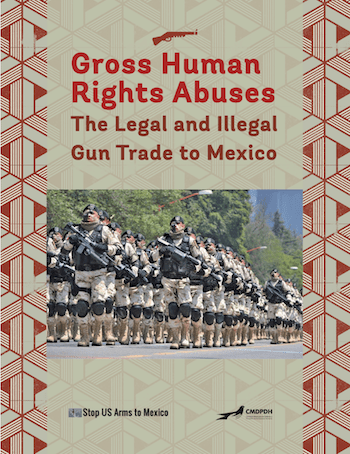 Gross Human Rights Abuses: The Legal and Illegal Gun Trade to Mexico. This report by Stop US Arms to Mexico and the Mexican Commission for the Defense of Human Rights presents new data and analysis as well as policy recommendations for U.S. policy-makers and the incoming government in Mexico. August 2018. Fact Sheet on Sig Sauer Arms Exports to Mexico, updated November 2018. “How U.S. Guns Sold to Mexico End Up with Security Forces Accused of Crime and Human Rights Abuses,” John Lindsay-Poland, The Intercept, April 26, 2018. Beyond Our Borders: How Weak U.S. Gun Law Contribute to Violent Crime Abroad, issue brief by Chelsea Parsons and Eugenio Weigend Vargas, Center for America Progress, February 2, 2018. Mexico Firearms Trace Data, 2012-2017, Bureau of Alcohol, Tobacco, Firearms and Explosives, March 2018. “What is the Level of Household Gun Ownership in urban Mexico?”, David Pérez Esparza and David Hemenway, presentation based on study published by Injury Prevention, December 2017. “Armed Violence in Mexico Fact Sheet 2016,” Desarma México, December 2016. Situation of Human Rights in Mexico, Inter-American Human Rights Commission, March 2016. US Efforts to Combat Firearms Trafficking to Mexico Have Improved, but Some Collaboration Challenges Remain, Government Accountability Office, January 2016. U.S.-Mexican Security Cooperation: The Mérida Initiative and Beyond, Congressional Research Service, January 2016. “Gun Running Nation,” WOLA and Violence Policy Center, July 2015. “Fast and Furious or Slow and Steady? : The Flow of Guns From the United States to Mexico,” Jessica Eby, UCLA Law Review, 2014. “Cross-Border Spillover: U.S. Gun Laws and Violence in Mexico,” Arindrajit Dube, et. al., 2013. “The US Firearms Industry: Production and Supply,” Jurgen Brauer, Small Arms Survey, 2013. The Way of the Gun: Estimating Firearms Traffic Across the U.S.-Mexico Border, Trans-Border Institute, 2013.